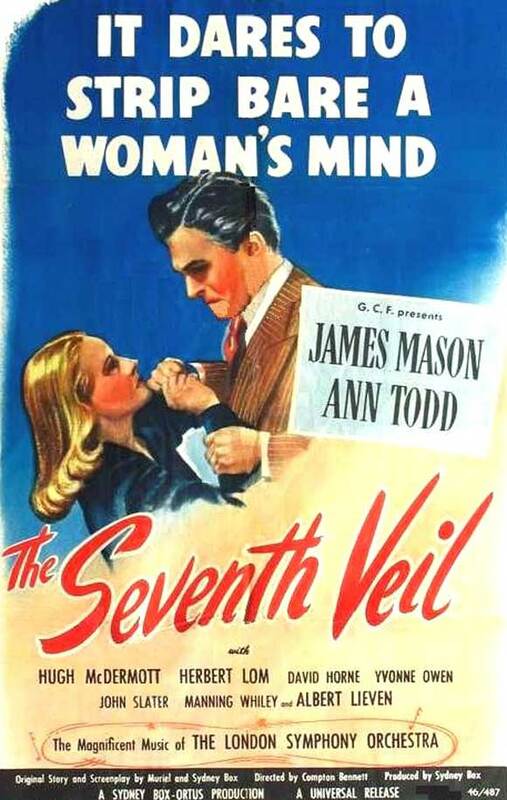 Compton Bennett’s film The Seventh Veil premiered in London on October 18, 1945. It was the biggest box office success of the year in Britain. The first record of its showing in the United States I can find is on Christmas day, 1945, in New York City. It went into wide release in the U.S. on February 15, 1946, and won an Academy Award the next year for best original screenplay. The story and script were by Sydney and Muriel Box. Sydney Box also produced the film. The mind Dr. Larsen is attempting to strip bare is that of Francesca Cunningham (Ann Todd), a concert pianist who has lost the will to live, and who has been hospitalized after a suicide attempt. For the first hour of the film, her psychoanalytic sessions with Dr. Larsen act mostly as a framing device for Francesca’s flashbacks, but by the end, the high-minded hooey is laid on nearly as thick as it is in Alfred Hitchcock’s contemporaneous film Spellbound. In her first flashback, Francesa recalls her schoolgirl days with her friend Susan Brook (Yvonne Owen). Susan’s insouciance towards academics is responsible for both of them being late to class one too many times. If Susan is punished, we don’t see it. Francesca’s punishment, however, will have dire ramifications. Brutally beaten across the backs of her hands with a ruler on the morning of her scholarship recital, she blows it completely, and is so devastated she gives up the piano. When she is orphaned at the age of 17, Francesca is taken in by her uncle Nicholas (James Mason), a man whom she barely knows. She learns that the term “uncle” is a misnomer, since Nicholas is actually her father’s second cousin. Interestingly, both Mason and Todd were 36 years old when they appeared in this film. Their lack of an age difference isn’t too distracting, though. Todd has a wan, ethereal visage that lends itself to playing young, and Mason’s dark, Mephistophelian countenance is eternally middle-aged and handsome. Nicholas is a confirmed bachelor who walks with a slight limp and hates women. He is also a brilliant music teacher, although his own skills as a musician are only average. Under his sometimes cruel tutelage, Francesca practices four to five hours a day, and eventually becomes an accomplished musician. Nicholas’s control over her comes at a cost. While she is studying at the Royal College of Music, Francesca falls in love with an American swing band leader named Peter Gay (Hugh McDermott). When Francesca tells Nicholas that she is engaged, he refuses to give his consent, since she has not yet reached her age of majority (in this case, 21), and tells her she will leave with him for Paris immediately. She does so, and continues her education in Europe. For a melodrama, The Seventh Veil manages to be fairly gripping, especially if you find depictions of live performances stressful. When Francesca makes her debut with the London Symphony Orchestra (conducted by Muir Mathieson), performing Rachmaninoff’s Piano Concerto No. 2 in C minor and Grieg’s Piano Concerto in A minor, the film cuts between Francesca sitting at the piano, her hands (doubled by the pianist Eileen Joyce), Nicholas standing offstage, and her old friend Susan, who is in the front row. Not only does Susan, now a wealthy socialite, enter late and talk during the performance, but her mere presence reminds Francesca so strongly of the brutal whipping her hands received as a girl that the act of playing becomes almost too much to bear. She makes it through the performance, but when she rises to bow, she collapses from sheer exhaustion. Francesca’s next trial — and the one that will result in her institutionalization — comes when Nicholas hires an artist named Maxwell Leyden (Albert Lieven) to paint her portrait. Francesca and Maxwell fall in love and go away to live together, despite Nicholas’s violent objections, but after a car accident, Francesca becomes convinced that her hands are irreparably damaged and she will never play again. Dr. Larsen, however, tells her there is nothing physically wrong with her, and he makes it his mission to cure her. In the end, it is a recording of the simple, beautiful melody of the second movement of Beethoven’s Piano Sonata No. 8, “Pathétique,” along with a good old-fashioned session of hypnosis, that frees Francesca from her mental prison. The climax of the film does not hinge on whether or not she will perform again, however. It hinges on which of the three men in her life she will end up with; Peter, Maxwell, or Nicholas. As soon as her choice is made, the film ends. There is no depiction of consequences. How satisfying the viewer finds the ending partly depends on which male character they like best, I suppose, although there are other considerations, such as how one feels about the question of whether it is better to be a great artist or to be happy, or even if Francesca can have one without the other. Personally, I found it all a bit ridiculous, but I enjoyed the film overall. Posted in 1945, 1946, December 1945, February 1946, October 1945 and tagged 19th Academy Awards, Albert Lieven, Ann Todd, Arnold Goldsborough, Beatrice Varley, Benjamin Frankel, Compton Bennett, David Horne, Drama, Eileen Joyce, Ernest Davies, General Film Distributors, Gordon Hales, Grace Allardyce, Herbert Lom, Hugh McDermott, James Mason, John Slater, Manning Whiley, Margaret Withers, Muir Mathieson, Muriel Box, Ortus Films, Reginald H. Wyer, Romance, Sydney Box, The London Symphony Orchestra, The Seventh Veil, Universal Pictures, Yvonne Owen. Bookmark the permalink. Hi Bob. While there’s no Region 1 DVD of “The Seventh Veil” available, if you go here: http://amzn.to/jdWsw0 you’ll see used VHS tapes of the film for sale. There’s one listed as “like new” for $12, and the seller has a 100% positive feedback rating. That could be a good bet. That’s great! I’m so glad you were able to see the movie again, and that it stood the test of time. It sounds like a great Father’s Day gift.